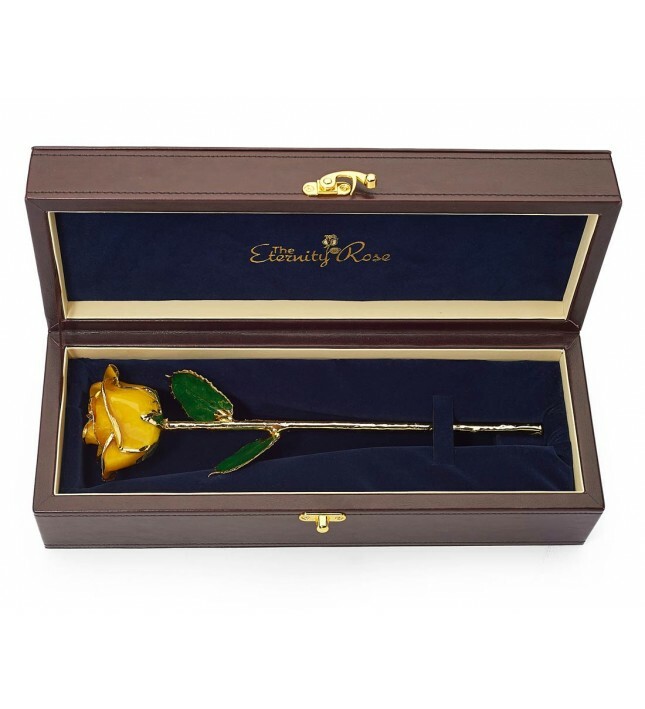 We present a natural yellow rose, plucked at the height of its perfection, and then glazed and gold-trimmed. 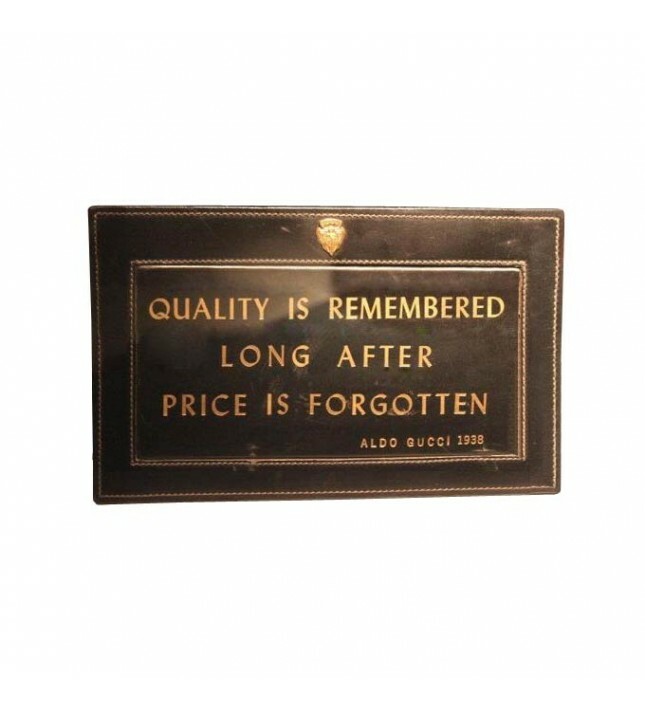 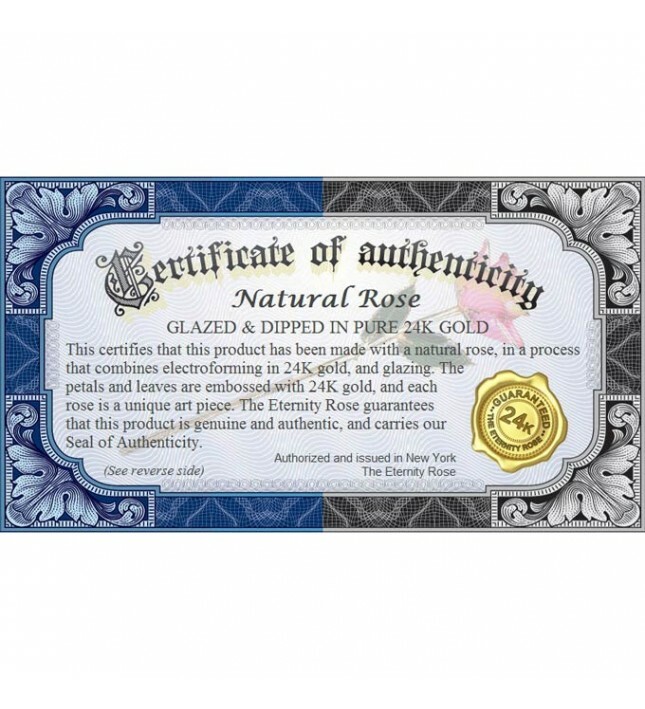 It holds a lustrous finish and is accompanied by a certificate of authenticity. 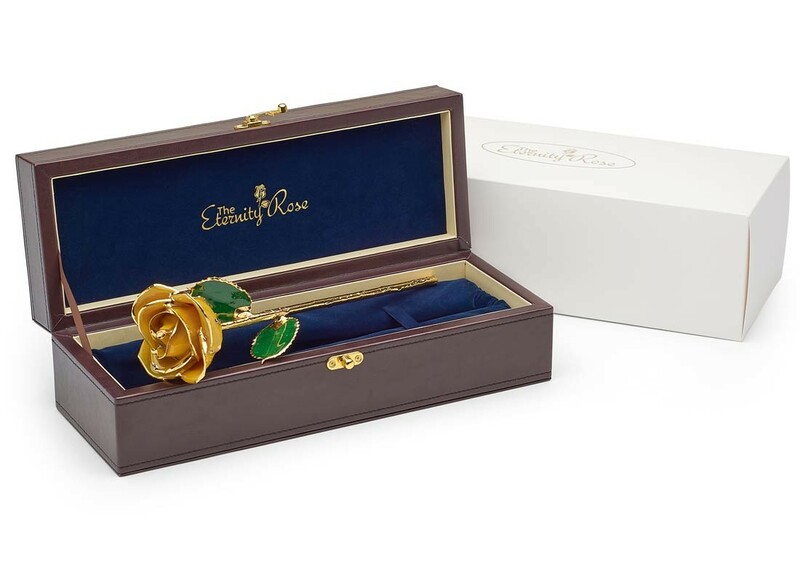 A symbol of enduring romance and natural beauty, each rose is unique, intricately crafted by hand, and designed to last for an eternity. 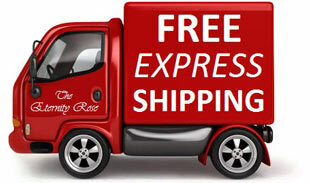 We provide free express delivery and fast order processing. 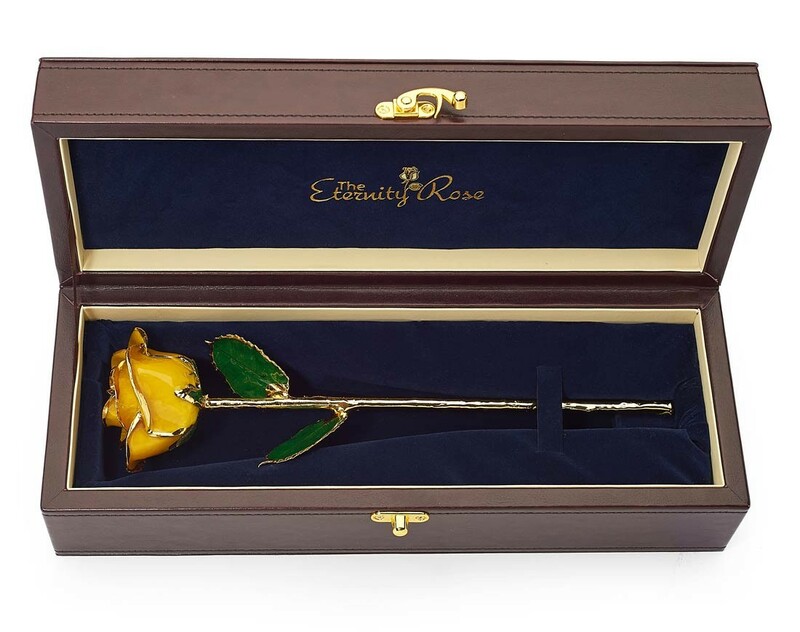 As part of our Eternity Rose collection, we present this gorgeous work of art which has been created by electroforming a natural yellow rose with 24 karat gold, and then covering the leaves and petals in a radiant glaze. 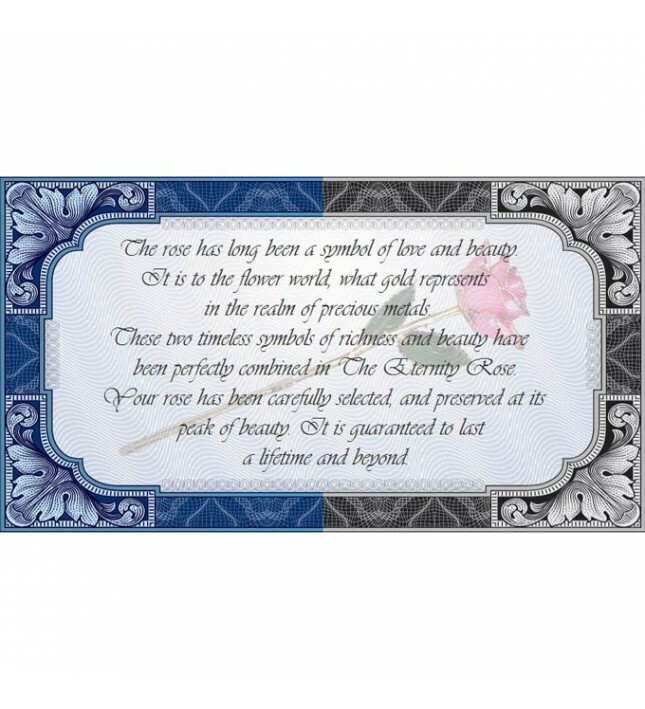 This unique and impressive gift speaks a thousand words, representing in its own magical way, deep sentiment and affection. 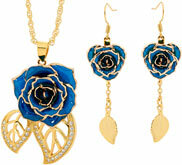 It beautifully combines the stylish elegance of the rose with the ornate majesty of an exclusive ornament. 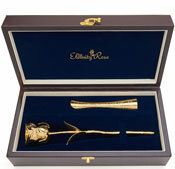 Your special woman is likely to allocate this gift pride of place in her display cabinet, nestled in its quality leather presentation case. 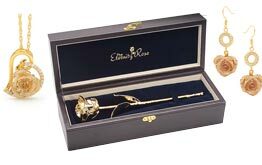 We typically recommend the rose is left in its display case rather than a vase, as the navy-blue velvet and leather surrounds show off the piece to its best advantage. 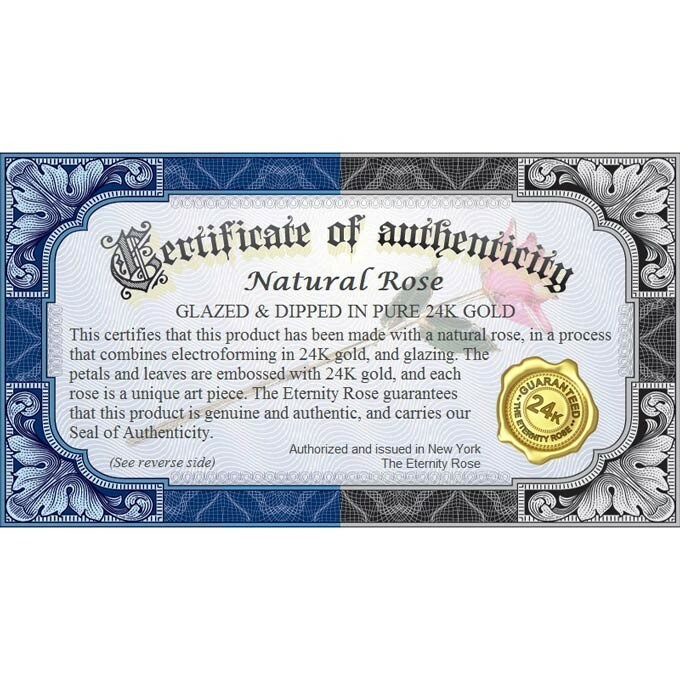 The roses used to create each Eternity Rose have been grown by qualified horticulturists in our very own nursery, and have been specially selected because of their natural beauty and color. 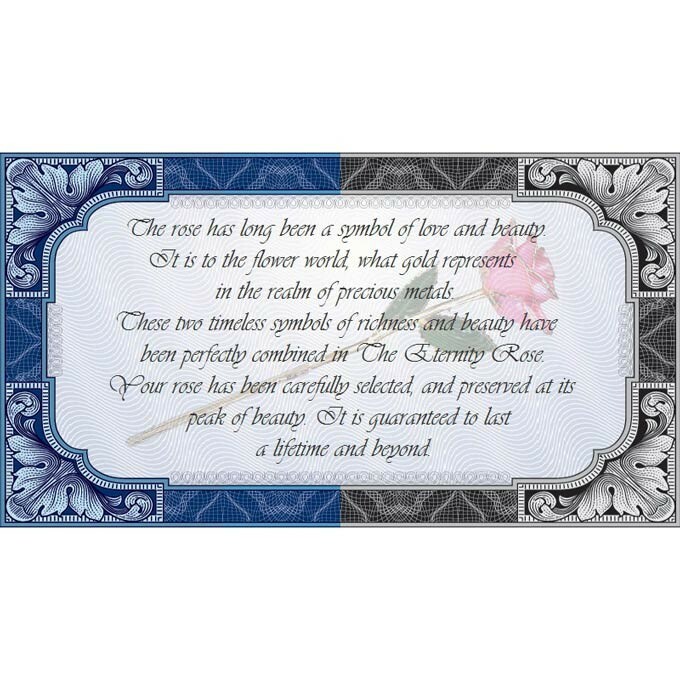 Constantly tended to, to ensure that they thrive, each blossom is plucked as soon as it begins to open, and is immediately glazed to make certain that its natural perfection is captured forever. 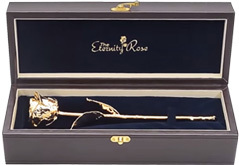 The time-span from picking the finest rose to achieving the finished product is no less than three months, with each flower completing a 60-step process to produce a piece of art that has been expertly crafted. 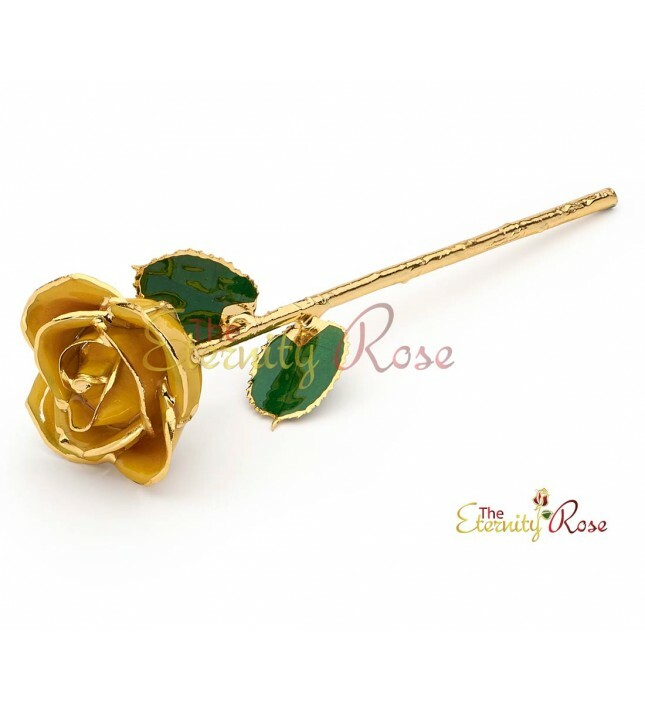 Initially, pure copper is electroplated onto the petals and leaves to create the ideal base, and then each flower is glazed by hand in a skilled procedure. 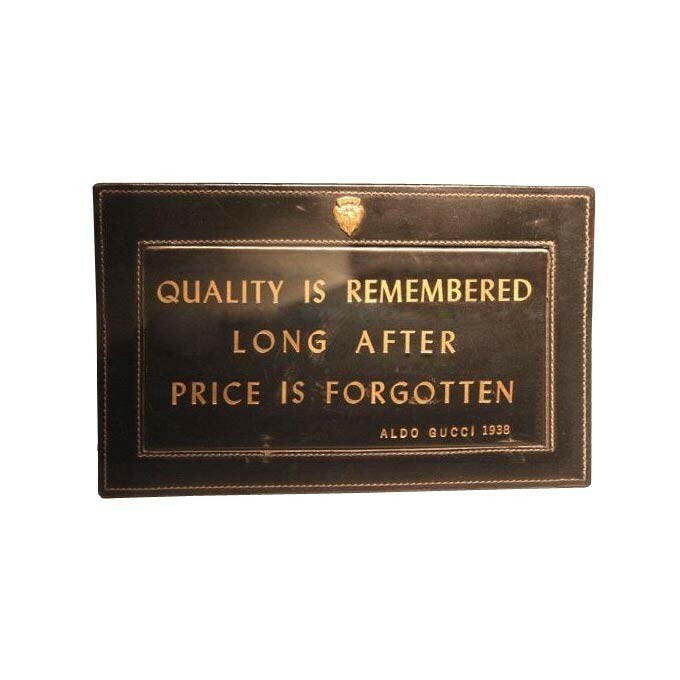 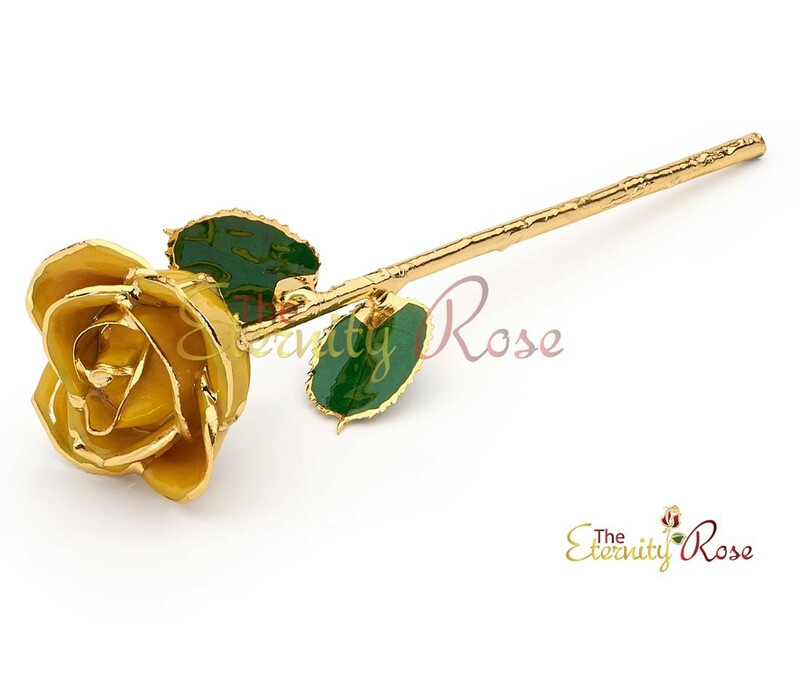 Finally, each petal and leaf is embossed with the purest 24 karat gold, with the final result being a brilliant and lustrous mirror finish that will neither fade nor corrode as the years go by. 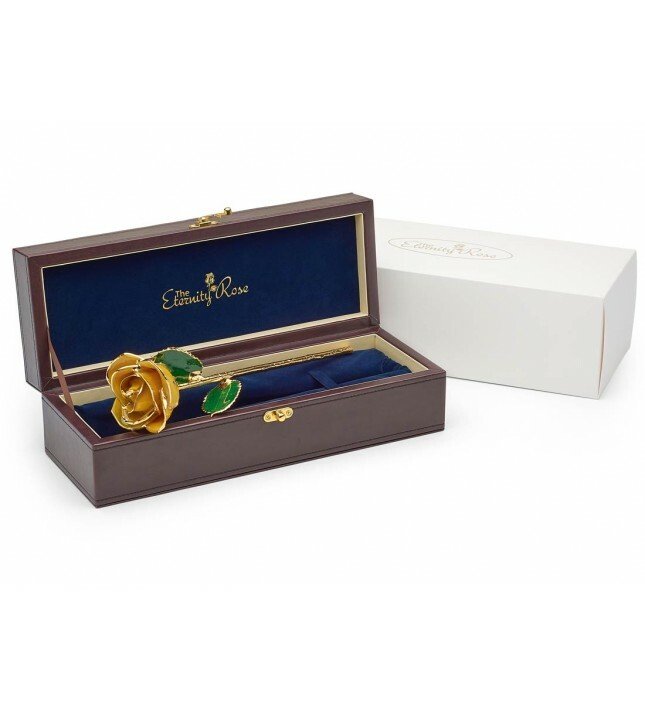 Show your loved one how precious she is by giving her the wonderful gift of the Eternity Rose; as beautiful as herself and as long lasting as your love. 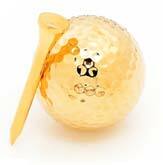 And if she fancies a little more bling, you may wish to consider a 24k gold-dipped natural rose.